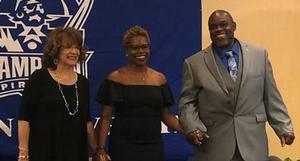 HAMPTON, Va. (June 3, 2018) – On Saturday night, Hampton University Athletics celebrated its past, present and future with the induction of the third class into the Hampton Athletics Hall of Fame. The event, sponsored by Hampton Nation and held at the Crowne Plaza Hampton Marina, was attended by over 200 fans and supporters of Pirate Athletics as three legendary figures in Hampton Athletics were recognized. Hampton alum and current Assistant Offensive Coach for the Detroit Lions Derius Swinton was the keynote speaker and he challenged the teams to continue to raise the standard of excellence as Hampton heads into the Big South Conference starting July 1. Mrs. Norma B. Harvey was inducted with the Humanitarian Award celebrating her 40 years of constant support for not only the student-athletes, but the entire athletics program. During her 40 years of service, Norma B. Harvey has been a respected figure giving student-athletes hope, drive and playing a vital role in empowering all she met. She attends as many as possible athletic events, keeping up with all statistics, standings and is considered by many across Hampton Nation as the number one fan of Hampton University. Jacqueline “Jacqie” McWilliams was a two-sport athlete as she pursued her Bachelor of Arts degree in Psychology from 1987-1990. Currently serving as the Commissioner of the Central Intercollegiate Athletic Association (CIAA), she was a member of the 1988 NCAA Division II Women’s Basketball National Championship team, as well as the 1987 and 1990 CIAA volleyball championship teams. Issac “Ike” Readon participated in wrestling and football in his time at Hampton, but made his mark on the defensive side in football. He played a key role in the 1985 CIAA football championship which was Hampton’s first in over 50 years. A two-time All-American and three-time Townsend Award winner, which is given to Hampton’s Most Valuable Player, Readon was drafted by the Kansas City Chiefs in 1986 and ultimately played for the Miami Dolphins. For information on donating to Hampton University Athletics, you can visit the Hampton Nation website at www.hamptonnation.com.